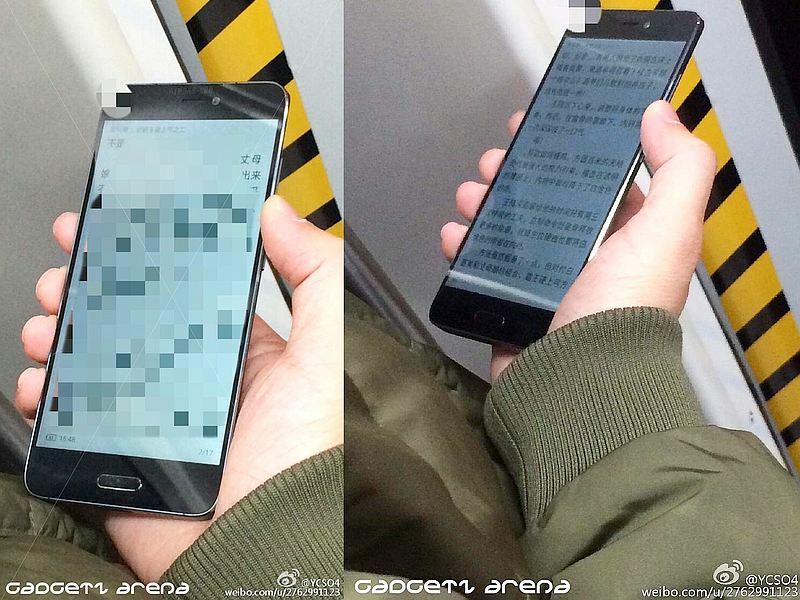 The upcoming Xiaomi Mi 5 smartphone once again appeared in leaked images on the Web. The live images are claimed to show the smartphone’s front panel. The photos allegedly showing the Mi 5 was posted by a user on Weibo, but have now been taken down. As seen in the two images (via GadgetzArena) the smartphone’s front-facing camera, home button, and metal chamfered edges go in line with what we have seen previously. It is worth mentioning that the images come couple of weeks after the smartphone popped up in leaked images and a video in its full glory. The handset is tipped to come in four different colours including Black, Gold, Pink, and White according to the leaked shots. The leaked video showed the device placed on a wooden dock and a user briefly browsing the handset’s interface. As leaked previously, the Mi 5 is tipped to sport a 2.5D curved glass display and 3D glass covering the back panel. The slim oval-shaped home button is said to double up as the fingerprint sensor, which is claimed to be the smallest and faster sensor in the market. Based on previous leaks, the Mi 5 is said to feature a 5.2-inch display with either full-HD or QHD resolution. The handset is said to come in two memory and storage versions – 3GB of RAM with 32GB inbuilt storage, and 4GB of RAM with 64GB storage. On the camera front, the Mi 5 is rumoured to pack a 16-megapixel rear camera and a 13-megapixel front-facing camera. It is also supposed to be backed by a 3600mAh battery with Quick Charge 3.0 tech. The handset is said to run MIUI 7 based on Android 6.0 Marshmallow. For pricing, the 32GB inbuilt storage and 3GB RAM version has been said to be priced at CNY 1,999 (roughly Rs. 20,300), the 64GB inbuilt storage and 4GB RAM priced at CNY 2,299 (roughly Rs. 23,400). In the meanwhile, we do have some official information about the Xiaomi Mi 5 – the company’s Co-Founder and Senior VP Liwan Jiang last week confirmed the Mi 5 flagship smartphone will sport a Snapdragon 820 SoC, and launch after the Spring Festival that this year starts on February 8, and lasts 15 days.